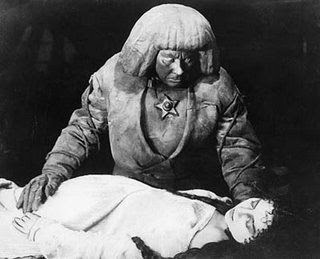 The Golem, How He Came Into the World (Der Golem: Wie er in die Welt Kam, 1920), by Paul Wegener and Carl Boese, is an early masterpiece of lighting and special effects and immediately influenced succeeding German production. Wegener had been fo r some years a top actor with Max Reinhardt’s theater in Berling, and Reinhardt’s influence is obvious in this fim. In fact most of the top German film actors, Basserman, Moissi, Winterstein, Beidt, Krauss, Loos, and Jannings, came from Reinhardt’s troupe. Reinhardt was the “Kaiser” of the Berlin theater and, often because of economic hardship after the war, developed ingenious lighting effects in order to minimize the staging expenses. Reinhardt, not an Expressionist but an “impressionist”, used his lighting and new acting techniques to develop a theater of intimacy known as the Kammerspiele, whose conception also later influenced the work of Pabst and Murnau. Wegener uses every one of Reinhardt’s lighting effects: the stars glinting against a velvety sky, the fiery glow of an alchemist’s furnace, the little oil-lamp lighting a corner of a darkened room when Miriam appears, the servant holding a lantern, the row of blazing torches flickering in the night, and, in the synagogue, the light trembling over the prostrate, indistinct forms wrapped in cloaks, with the sacred, haloed seven-branched candelabra emerging from the darkness.. Since Wegener was primarily an actor, he liked to surround himself with men of great technical ability. Thus his set designer was the brilliant architect Hans Poelzig, creator of the Grosses Schauspielhaus in Berlin. Poelzig expresses all a building’s dynamic ecstatic, fantastic, and pathetic elements in the facade without extending any renewal of forms to the layout itself. Thus the non-abstract sets of The Golem are a far cry from those of The Cabinet of Dr. Caligari. This lends a certain stability which heightens the intensity of the Expressionistic shock lighting effects, such as the livid, angui9shed faces of the faithful in the synagogue. The idea of a monster representing the uncontrollable or anti-social elemen t in the personality of its creator is a natural for Expressionistic presentation, which is always an exterior manifestation of the interior, non-objective world. 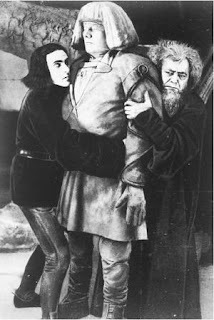 In fact, Wegener himself had made an earlier version of The Golem in 1914, which is now lost. This depiction of the other self is a favourite Germanic image. Other examples of this treatment (known as “doppelganger”) in the dearly German film appear in two versions of The Student of Prague and Homunculus. The reality of the other self is far from a mere stylistic tool; it is an idea embedded deeply in the consciousness of Western society and is all the more intriguing in light of such writings as those of the British psychoanalyst, R. D. Laing.